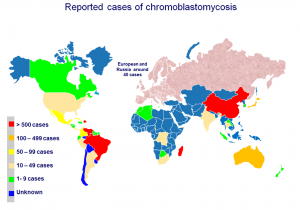 The worldwide prevalence of chronic pulmonary aspergillosis is presented here as an interactive map – click on categories in top left of maps to see total population statistics, incidence of CPA annually and over 5 years; and the mortality rate from TB. Click and drag the map to enlarge and hover with mouse to view individual countries. The worldwide prevalence of rVVC is presented here as an interactive map. Click on the map to activate and drag the map to enlarge and view individual countries. Click and drag the map to enlarge and view individual countries and select the category you want to see. Click on the maps to activate. Fungal allergy represents a worldwide health problem. The world map below (article here), highlights in yellow all countries in which sensitisation to fungi has been described.